2nd Sunday of month at 12:00pm Noon in Rectory. Baptism: 3rd Sunday of the month at 12:00pm Noon. Seasonal Services: Announced in Bulletin. sick or housebound or if a visit is desired. with a priest or deacon of the parish. who should register individually as adult parishioners. Sacraments of Initiation at the usual time. on the part of the family or young adult. here on the Canon Law Requirements document. A Sponsor must be a Confirmed practicing Catholic at least 16 years of age. not by a Justice of the Peace or Ordained Minister of another faith. and all National, Legal Holidays. information, please contact the rectory. funeral rites at St. Stephen's. arranging funeral rites in the parish. First Penance/Reconciliation takes place in the winter of the second grade. Two years of instruction are required. First Communion is celebrated on first Saturday of May in the second grade. Two years of instruction are required. The sacrament of Confirmation is administered in 7th grade. Two years of instruction (grades 6 & 7) are required. Confirmation is usually scheduled in the spring. The exact date varies from year to year. A meeting is held with the parents and candidates for Confirmation to explain the necessity and importance of practicing the faith as an essential step in the direction of receiving this sacrament. 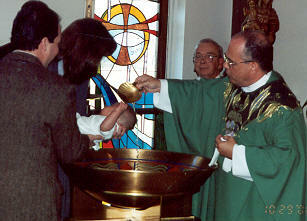 Rite of Christian Initiation of Adults (R.C.I.A. ): For those wishing to become Catholics, the R.C.I.A. 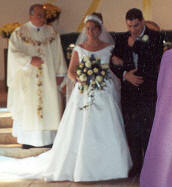 is a process for preparing and welcoming new members into the Catholic Church. The process begins with a period of inquiry in late summer, and reaches a climax at the Easter Vigil the following year at which time new members are baptized or received into full communion with the Church. After Easter, there is a period of follow-up to encourage deeper development of the faith. Anyone interested in participating should contact the Rectory for details. Ministry to the Sick: To arrange for the Sacrament of Reconciliation and/or the Sacrament of Anointing of the Sick, please call the Rectory. Holy Communion is brought to the sick and housebound each month, and on a weekly basis whenever possible. If you know of anyone who would like to receive these sacraments, please notify the Rectory at (856) 662-9338. IN OUR SPIRITUAL AND SOCIAL LIFE.